When Neil Armstrong took humanity's first otherworldly steps in 1969, he didn't know what a nuisance the lunar soil beneath his feet would prove to be. The scratchy dust clung to everything it touched, causing scientific instruments to overheat and, for Apollo 17 astronaut Harrison Schmitt, a sort of lunar dust hay fever. The annoying particles even prompted a scientific experiment to figure out how fast they collect, but NASA's data got lost. Or, so NASA thought. Now, more than 40 years later, scientists have used the rediscovered data to make the first determination of how fast lunar dust accumulates. It builds up unbelievably slowly by the standards of any Earth-bound housekeeper, their calculations show – just fast enough to form a layer about a millimeter (0.04 inches) thick every 1,000 years. Yet, that rate is 10 times previous estimates. It's also more than speedy enough to pose a serious problem for the solar cells that serve as critical power sources for space exploration missions. "You wouldn't see it; it's very thin indeed," said University of Western Australia Professor Brian O'Brien, a physicist who developed the experiment while working on the Apollo missions in the 1960s and now has led the new analysis. "But, as the Apollo astronauts learned, you can have a devil of a time overcoming even a small amount of dust." That faster-than-expected pile-up also implies that lunar dust could have more ways to move around than previously thought, O'Brien added. 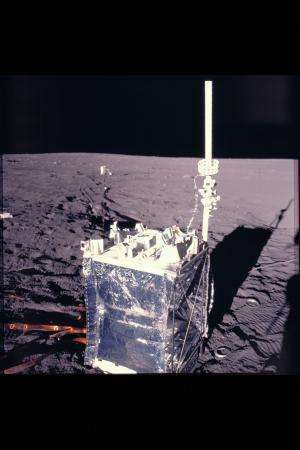 In his experiment, dust collected on small solar cells attached to a matchbox-sized case over the course of six years, throughout three Apollo missions. As the granules blocked light from coming in, the voltage the solar cells produced dropped. The electrical measurements indicated that each year 100 micrograms of lunar dust collected per square centimeter. At that rate, a basketball court on the Moon would collect roughly 450 grams (1 pound) of lunar dust annually. Comparing the effects on cells from dust and from damaging high-energy radiation from the sun, O'Brien found that long-term dust accretion could diminish the output from shielded power supplies of a lunar outpost more than even the most intense solar outbursts. Because the threat posed by radiation damage was recognized early on, solar-cell makers fortified their devices against that sort of harm. Yet, "while solar cells have become hardier to radiation, nothing really has been done to make them more resistant to dust," said O'Brien's colleague on the project Monique Hollick, who is also a researcher at the University of Western Australia, in Crawley. "That's going to be a problem for future lunar missions." The work is detailed this week in Space Weather, a publication of the American Geophysical Union. Before Apollo 11 blasted off to the Moon in 1969, NASA scientists realized the Lunar Module would likely kick up a large amount of lunar soil on takeoff, potentially coating nearby science experiments with dust. Detachable covers would require either a small explosive or a physical mechanism to remove after the astronauts left, creating more engineering challenges and room for failure. "Then I asked what I thought was a pretty common sense question," recalled O'Brien. "If we've got to guard ourselves against damage from the lunar module taking off, who's measuring whether any damage actually took place; who's measuring the dust?" O'Brien proceeded to quickly invent the Lunar Dust Detector experiment as a small add-on device to the larger experiments. Requiring little power and weighing only 270 grams (0.6 pounds), the dust detector reported back to Earth alongside the non-scientific housekeeping data. "It really got a free ride," O'Brien said. The detectors flown on Apollo 12, 14 and 15 operated until NASA shut them off in September 1977 due to budgetary concerns. While the detectors worked properly, NASA did not preserve the archival tapes of the data they collected. For three decades NASA assumed the dust detector data had been lost forever, until 2006 when O'Brien heard about NASA's mistake and told them he still had a set of backup copies. Each detector in the experiment had three solar cells, each covered with a different amount of shielding against incoming radiation. By comparing damage to the unshielded and shielded solar cells, O'Brien made his determination that dust, rather than radiation, caused the most degradation to the protected cells. Previous model-based estimates of lunar dust accumulation assumed the dust came entirely from meteor impacts and falling cosmic dust. "But that's not enough to account for what we measured," O'Brien said. With no atmosphere for wind, the Moon's soil should be stagnant. However, O'Brien said a popular idea of a "dust atmosphere" on the Moon could explain the difference. The concept goes that, during each lunar day, solar radiation is strong enough to knock a few electrons out of atoms in dust particles, building up a slight positive charge. On the nighttime side of the Moon, electrons from the flow of energetic particles, called the solar wind, which comes off the Sun strike dust particles and give them a small negative charge. Where the illuminated and dark regions of the moon meet, electric forces could levitate this charged dust, potentially lofting grains high into the lunar sky. "Something similar was reported by Apollo astronauts orbiting the Moon who looked out and saw dust glowing on the horizon," said Hollick. The idea of levitating lunar dust could soon be confirmed by NASA's Lunar Atmosphere and Dust Environment Explorer (LADEE), launched in September. The spacecraft orbits 250 kilometers (155 miles) above the surface of the Moon, searching for dust in the lunar atmosphere. While LADEE scours the Moon's atmosphere, O'Brien looks back on a decades-long science experiment that finally has a result. "It's been a long haul," said O'Brien. "I invented [the detector] in 1966, long before Monique was even born. At the age of 79, I'm working with a 23-year old working on 46-year-old data and we discovered something exciting—it's delightful." NASA launching robotic explorer to moon from Va.
Gotta love that 30 years later, good science is still being done because of mankind's greatest adventure. Just goes to show you those moon landing hoaxers at NASA will go to any length to keep up the charade, like fabricating a several year data series, "losing" it then pretending to find it again after 30 years. But why would they do that? Oh! maybe they actually did land on the moon then? Occam might tell us that this would be the simplest scenario. Hey, but why ditch a good conspiracy theory when you've got one?